If you live in North America then you have most likely heard of the ongoing stand off at “Standing Rock”. The Native American people have been standing in opposition, protest and as a human blockade to stop a pipeline from being installed that will pass through sacred land and waters. It has been interesting to see how people from every race and color, from all over the nation, have joined them and stood at Standing Rock with them. They have stood in the cold, faced opposition, imprisonment and many other trials but they have STOOD! Now, suddenly breakthrough is happening. The pipeline pathway has been stopped and rejected by the authorities. The fight may not be quite over but a strong victory has begun. Why am I sharing this? Because it is a picture of how God’s people have stood on the Rock of Christ in an extended time of opposition, demonic trespassing, exposure to darkness and cold, being imprisoned in negative circumstances and often feeling defeated. But…YOU HAVE STOOD!! 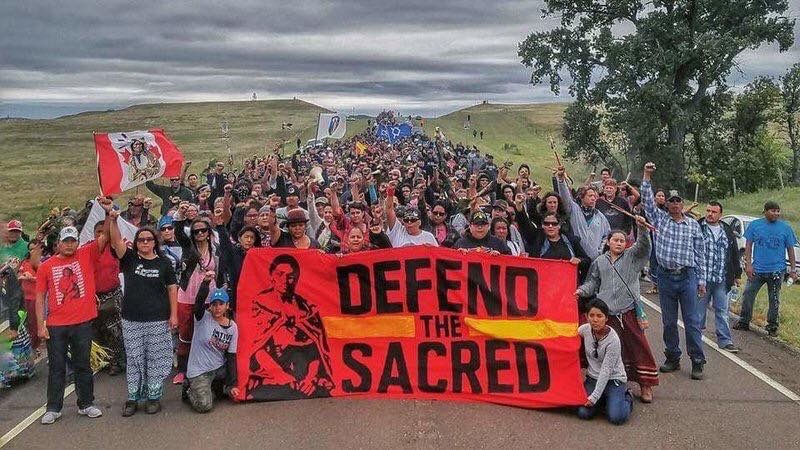 I believe that the emerging victory for those who have stood at Standing Rock is a signpost in the natural of a victory in the spirit for those who have stood on the Rock awaiting their breakthrough. The trespasser (the enemy) and his desire to defile the land and water (flow) of your life is being stopped and access is being removed. No matter what side of the issue you have stood in the natural scenario; it is a prophetic picture of victory! I also want to point out how significant it is that many have stood with the tribes during this stand off. I believe that breakthrough comes as God’s people stand with individuals, families, ministries and nations. I believe that the victory that is being obtained at Standing Rock has occurred because of all who have stood with them in agreement and in the fight. We are a part of a family of believers and we were never meant to stand and fight alone. In a family one should not thrive while another suffers if family stands and fights together. The lack that many families and ministries are even now facing can be broken through if we will stand together. This is a key to breakthrough. Today I stand with you!! I stand on the Rock of Christ with you in agreement with His intercession and plans for your life. I may not know you but He does! Therefore my agreement is not in vain or in ignorance; it is agreeing with His will for your breakthrough in every area. I join you at your personal “Standing Rock” and say, “No more trespassing!” to the enemy. Your victory has begun! Just as the federal government has stepped in for those at Standing Rock, I declare that the government of God and the counsel of the courts of Heaven is now intervening on your behalf. great analogy . Thank you for your stand with and for those of us who read Oceans In The Desert Gods Blessings for you and yours. KEEP letting HIM use your gift !